HP has launched a free iPhone app, that lets you print your photos directly to any WiFi HP printer, HP iPrint Photo. I have just been testing HP iPrint Photo put with my iPhone, and my HP C4500 WiFI printer, and I have to say it works very well. 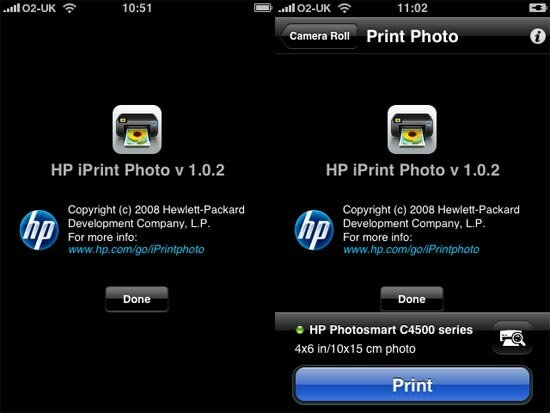 HP iPrint Photo is very easy to setup, all you need to do is install it on your iPhone and within minutes you can automatically print any photo you have on your iPhone direct to any HP WiFi Printer. There is no need to set it up with a specific printer, or enter any security codes, as long as your iPhone is connected via WiFi it works without any setup. The photo quality is pretty good, I have printed a couple of photos taken on my iPhone and on my digital camera an they come out great. 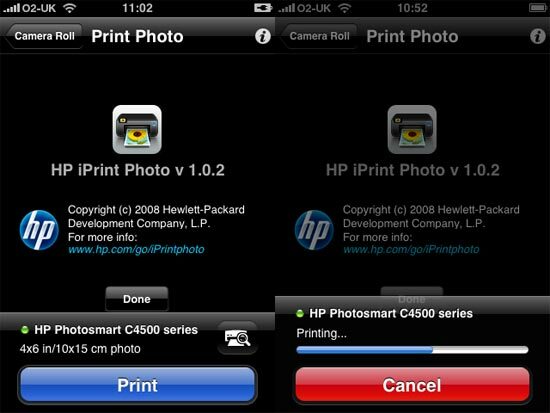 The HP iPrint Photo iPhone app is available as a free download from the app store, here’s the download link. Download HP iPrint Photo iPhone – Free. It will only work with HP printers, but I am sure it won’t be long before we see other manufacturers releasing applications that let you print directly from your iPhone.